Race, ethnicity and sexual orientation may not be the first things that come to mind when you think about ADD, but no mental health condition–including ADD–can be accurately diagnosed or effectively treated without considering how race, ethnicity and sexual orientation come into play. 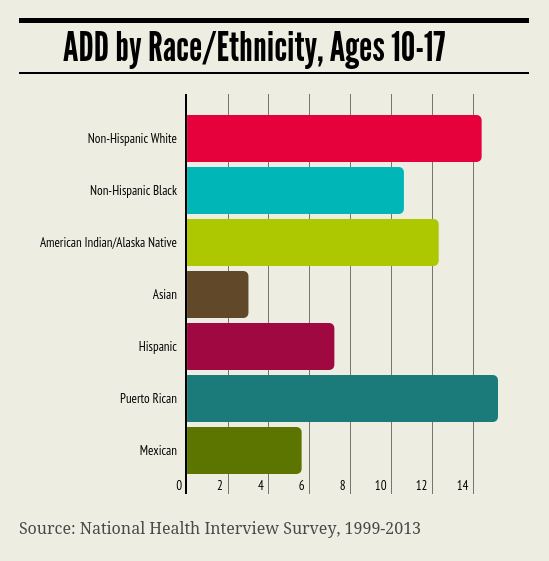 There are significant differences in ADD diagnoses across racial and ethnic groups in the United States (see chart below). ADD diagnoses are higher among non-Hispanic whites than for minorities, even though actual prevalence is probably similar across all racial-ethnic groups. The differences in ADD diagnoses along racial lines may be explained in part by cultural factors that influence parents’ view of their children’s behavior. As psychologist Lauren Marie Haack explains, available studies suggest that Latino children are at a great or greater risk of developing ADD, but their parents are much less likely to identify their problematic behavior. As a result, they are less likely to receive a proper assessment and treatment. In order to bridge this gap, Haack and her colleagues tested the ADHD-FX, “a culturally sensitive assessment measure of functional impairment related to ADHD for diverse families.” Initial results indicate that the ADHD-FX is a “reliable, valid, and culturally appropriate measure to assess functional impairment related to ADHD” including academic challenges and difficulty with family relationships. While factors related to race and ethnicity may lead to under- or misdiagnosis of ADD, institutionalized racism within the medical profession may also lead to misdiagnosis, inappropriate treatment and negative health outcomes. As clinical psychologist Eric Greene demonstrates in this case study, the “longstanding tradition” diagnosing and treating patients based solely on biological or psychological factors “runs the risk of oppressing patients further by denying the effects of their social context.” In this case, Greene describes an African-American boy who was misdiagnosed and treated for ADD when his symptoms most likely stemmed from the trauma and ongoing violence that he experienced during his childhood. Most recently, a study published in 2015 found that Hispanics in the United States face “many barriers to seeking and receiving treatment for mental health conditions such as ADHD.” Low incomes and a lack of health insurance limit access to quality care, while “language and cultural barriers keep some Hispanic patients from seeking treatment.” The study found that the importance of self-reliance, mental illness stigma, and misinformation about mental illness and treatment may have also prevented Hispanics from seeking ADD treatment. Psychiatrist Anthony L. Rostain also published research in 2015, which focused on African Americans’ access to mental healthcare. Rostain found that they often do not receive care for conditions like depression and ADD due to a lack of health insurance and an inability to pay for mental health services. Rostain also attributes African Americans’ lack of access to care to stigma toward mental illness.